Your one stop shop for fast and reliable Shoutcast Hosting. Start your own online radio station in minutes. Our plans are listed below. Get started with your own online radio station today. Play music to a wide audience of listeners from around the globe. This allows you to upload and broadcast from a predefined playlist 24/7 to your station. Setup a web player that allows anyone to easily listen to your station by a few clicks. Monitor the station of your radio and how many listeners are tuned in worldwide. We give you the option to easily switch between version V1 and V2 of the server. Easily Redirect your station to broadcast another shoutcast radio station. We provide one click scripts that generates code to use on your website immediately. 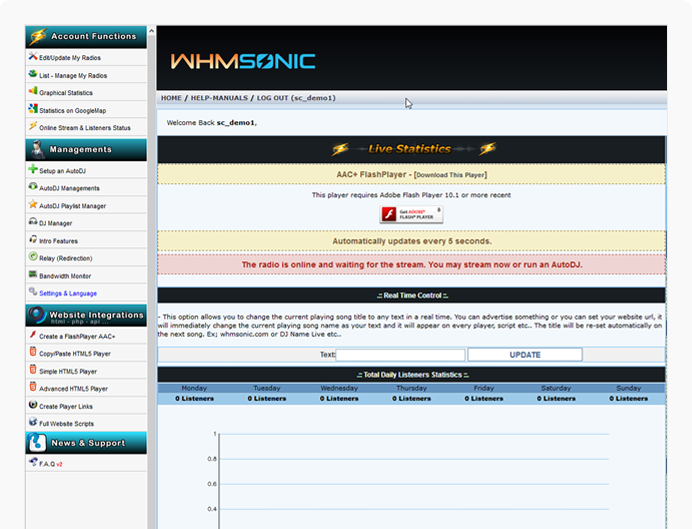 With the WHMsonic panel, it makes it easy to manage your radio station. United FM radio has been with color host for the past 5 years and we've received nothing but fast reliable and stable service along with professional and helpful technical service. Shoutcast is a internet radio platform. It allows you to broadcast and share music on the internet to any listener in the world. How do i get started broadcasting on my station? You would need a certain external program to broadcast to your station. Winamp is a recommended tool. If you need help feel free to contact us for assistance on setup. Simply upload your mp3s, create a playlist, and start the service. You can shuffle, play in a particular order and even carry out playlist scheduling. Switch off your PC and let us do the broadcasting for you. Do i need a microphone for broadcasting? How will mobile users listen to my station? You can listen via any mobile phone by using a app called TuneIn, or you can use your browser with a HTML5 web player. Can i embed my station onto my existing website? Sure you can! We provide the scripts to generate a web player for you to place on your site. Can i provide my DJs with login to the service? Absolutely. You can create as many DJ usernames as you like. You can also set their access levels if you do not want them to access all the admin features. Will i be able to do a telephone call with listeners? You can attatch a phone line to your soundcard to broadcast calls, we do however prefer skype. With skype you can go direct with no phone by setting our software to pick up all audio from your computer soundcard. Can i check how many users are listening? Our control panel includes complete statistics, and history of your listeners. This includes listening hours, geographical details, and device measurements. What happens if i have issues with setup? We are here 24/7 if you need assistance. Feel free to give us a call or submit a ticket if trouble occurs.